I never noticed them before, but, come 5.30pm in the City there seem to be hundreds of runners obviously running home. It’s only recently I’ve occasionally joined them and discovered all the added dimensions this brings. Running home from work is not without its challenges, and certainly not something to do on the spur of the moment- it needs careful thought and preparation. Ideally you need to avoid running with a bag which means some careful juggling of things between between gym bag, office bag, and desk drawers. Shoes are left under the desk, shorts and T-shirt donned in the office toilets and the days clothes stuffed in drawers to worry about later. Weighty loose change removed from wallet, essential valuables accommodated in shorts pockets, phone armband strapped on, water bottle filled at the cooler and diary checked to ensure there’ll be time in the morning to çome to the office and change shoes before first meeting. With all that accomplished I leave the office feeling half naked with bare arms and legs – double checking I actually do have train ticket and house keys, and hoping there is another clean pair of trousers at home for the morning. I’ve never actually run all the way from the City to Highams Park – 15k or so after a day at work feels like too much, so I head for my normal train from Liverpool street and get off at Clapton. 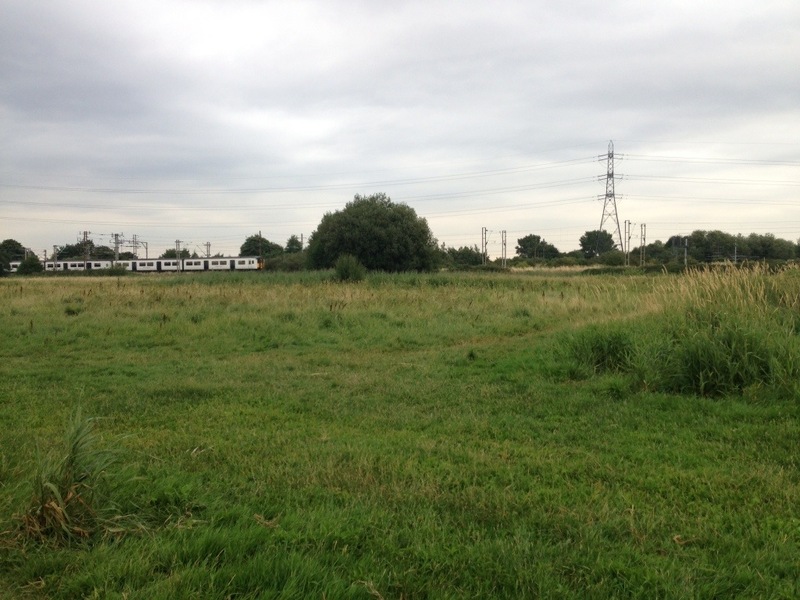 Anyone who commutes on this line will know that Walthamstow Marshes lies between Clapton and St James Street stations. It’s not unusual for a train to stop for a minute or so between these stations and its then that tired commuters look up from phones and newspapers and gaze across the fields. Cows now graze on the marshes for much of the year, you can see more sky than from most places in London, and its entirely possible to forget, for a moment, that you’re somewhere between Hackney and Walthamstow. That escapist feeling hits tenfold when you jog onto the marsh after a short trip down Southwold Road, from Clapton station. It’s multiplied again when you see a train that you could well have been sweating on pass over the bridge in front of you. This section of the journey home really does makes any of the inconveniences seem worthwhile. 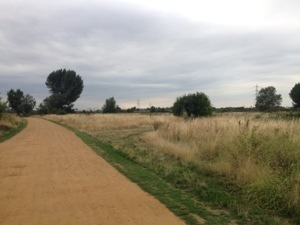 For a mile and a half, jogging along the path by the Lee, or directly across the meadow with the Olympic stadium and Orbit visible in the distance, then along the road past the reservoirs and waterworks to Coppermill Lane, thoughts of the days events are processed and dismissed for the evening. If seeking a shorter run it would be easy enough to finish at St James Street or Blackhorse Road, and pick up transport from there. 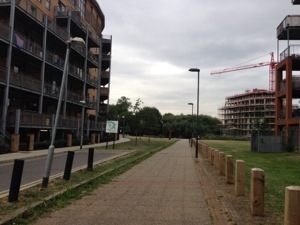 I continue through streets lined with Walthamstow’s famous Warner housing, and through the Priory Court estate, emerging onto Chingford Road to cross the North Circular and return to Highams Park. This entry was posted in Running on the edge, Walthamforest and tagged running, Waltham Forest, walthamstow marsh.